Here is a look at the entire card with a word on the top bouts and why you should watch. Rematch will be the word of the day in Japan. There are three of them and none bigger than the battle for the ONE Lightweight World Title. Reigning ONE Lightweight World Champion Eduard Folayang owns a stoppage win over Shinya Aoki from their first meeting back in November 2016. At the time, Aoki was champion and he looked unbeatable as he mowed down every opponent he faced in the lightweight division. The resilient and conditioned Folayang wouldn’t be denied and his constant pressure led to the TKO victory and his first title reign. Folayang has since lost the title and regained it while Aoki battled through the toughest patch of his glorious career to ascend back to the mountaintop. Now he will challenge for the World Title against the man who dethroned him, and Aoki will do it in front of his adoring countrymen in Japan. It would be hard for any bout on the card to follow this one, so it’s good it is the main event. You know the main event has to be special if a champion-vs-champion superfight is the co-main event. ONE Women’s Atomweight World Champion Angela Lee will put her undefeated professional record on the line as she climbs up to strawweight to challenge Xiong Jing Nan for her ONE Women’s Strawweight World Title. Lee has battled past Japanese legend Mei Yamaguchi on two occasions but this battle with the powerful Xiong will be the biggest challenge of Unstoppable’s short, but impressive career thus far. Ever since Xiong arrived in ONE, she’s done nothing but dominate her opponents. She too will be facing her toughest test. Which world-class martial artist will emerge victoriously? As mentioned before, rematches are aplenty on this card. In 2018, ONE Middleweight World Champion Aung La N Sang and Japan’s Ken Hasegawa battled in the Bout of the Year. Aung La successfully defended his World title after securing a fifth-round KO, but Hasegawa represented himself well. Now Hasegawa will get a rematch with the “Burmese Python”, but this time, the scrap takes place in the challenger’s home country. Can Aung La duplicate his performance, or has Hasegawa found some answers, and is he capable of using his fans’ energy to supplant Aung La as champion? This figures to be another brawl and it could steal the show. Yet another rematch comes our way here, and this one is the third bout in the series between reigning ONE Bantamweight World Champion Kevin Belingon and Bibiano Fernandes. In 2018, Belingon avenged a submission loss to Fernandes in their first meeting. Belingon took the bout by a narrow decision, and because of Fernandes’ long-standing reign as bantamweight king, he was awarded an immediate rematch. With Belingon’s margin of victory far smaller than what Fernandes enjoyed in their bout, there is something for the Filipino warrior to prove. Brazil’s Fernandes wants nothing more than to win his title back, and both men want to win the series. On most cards, this would be the main event. On March 31, it will be the first co-main event. The debut of legendary 12-time Flyweight Mixed Martial Arts World Champion Demetrious “Mighty Mouse” Johnson will be the last non-title bout on the card. 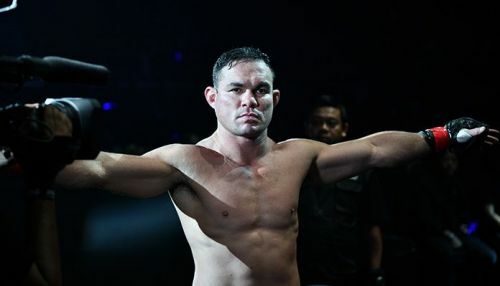 He faces local hero Yuya Wakamatsu in his promotional debut and it will be one of the more highly-anticipated first looks in mixed martial arts history. Johnson is still widely regarded as one of the best pound-for-pound mixed martial artists in the world, and he’ll be looking to show that against Wakamatsu. “The Underground King” Eddie Alvarez is in the same situation as Johnson. He’s a former multiple-time Mixed Martial Arts World Champion making his ONE Championship debut and looking to make a statement. Alvarez faces Russia’s Timofey Nastyukhin in the first round of the ONE Lightweight World Grand Prix. He is expected to challenge for ONE’s gold at some point, and perhaps become the first man to win a world title in the three major global mixed martial arts promotions. Nastyukhin represents Alvarez’s first impediment, as he had constantly asked for the toughest most dangerous opponent available. Nastyukhin certainly fits that bill. Expect a tremendous war of attrition in this exciting lightweight matchup.